Have you met our suuuuper flakey, buttery and tasty gluten free and keto pie crust? 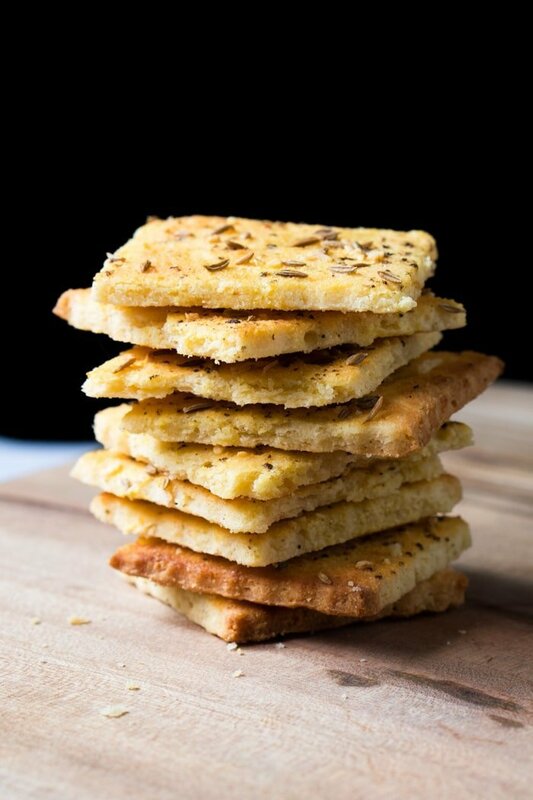 Because these keto crackers are just that. Fact is, many of you reported back that you love it for crackers, even going as far as saying that they taste just like buttermilk biscuits. And yup, the cream cheese here adds a wonderful tanginess to the buttery mix. But for the past few months we’ve been playing around with various toppings. And let’s just say that you most definitely want to top these guys up with a little garlic powder (or granules), caraway seeds and a touch of freshly ground black pepper. They truly become ‘oh-my-gaaaawd‘ good! And paired with oozing brie? Wooowza! And adding a touch of our keto cranberry relish? Booooom! 💣⚡🔥!! And don’t be afraid of the seemingly long list of ingredients, as you’re likely to have most in your cupboard/fridge already. And remember that, like with any pastry dough, you need to work quickly and over a cool surface. Though do note that if the dough becomes too hard to manage, you can always pop it back in the fridge/freezer for 15 minutes before carrying on! When rolling out you may want to use parchment or wax paper. Given the lack of gluten, the dough is more fragile and it will break easily if not handled with care. So we suggest rolling it out between two sheets of parchment paper (see video). Easy peasy. One last thing (promise!). Like with any pastry dough, make sure not to over-process the dough. The mixture ought to resemble coarse breadcrumbs rather than cookie dough. It will make the pastry much more flakey and (perhaps surprisingly) easier to handle. These keto crackers, based off our popular cream cheese pie crust, are ridiculously flakey, buttery and tasty! 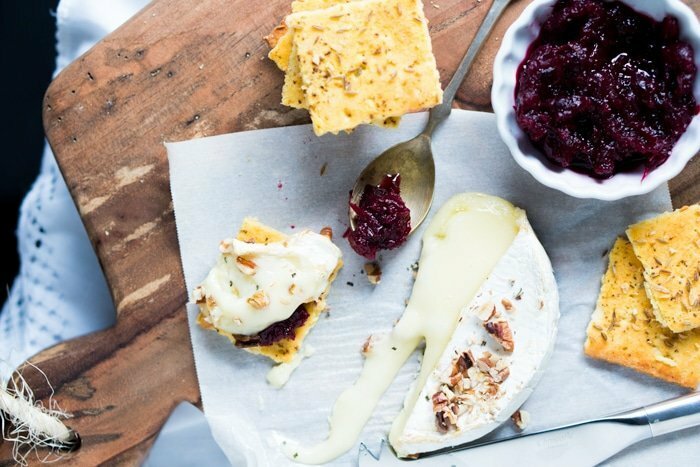 Topped with caraway seeds, garlic powder and a touch of freshly ground black pepper, they are an absolute must for your cheeseboard's delight. Add almond flour, coconut flour, xanthan gum, and salt to food processor and pulse until evenly combined. Add butter and cream cheese and pulse for just a few seconds until crumbly. Add in egg and vinegar and pulse until the dough just begins to come together (but stop before it forms into a ball). Like with any pastry dough, make sure not to over-process the dough. The mixture ought to resemble coarse breadcrumbs rather than cookie dough. Roll out dough between parchment paper, cut into desired size and pop it back into the fridge for 10-15 minutes prior to baking. Brush with egg wash and sprinkle with garlic powder, caraway seeds and freshly ground black pepper. Bake at 350°F/180°C for 17-20 minutes until lightly golden. They will firm up while cooling. When rolling out the dough you may want to use parchment or wax paper. Given the lack of gluten, the dough is more fragile and it will break easily if not handled with care. So we suggest rolling it out between two sheets of parchment paper (see video). Easy peasy. Oh, and (as with regular pie crust/pastry dough) try to work quickly or put your dough back in the fridge for 15 minutes if it begins to warm up too much. Please note that nutrition facts were estimated for a 6×2-inch crackers serving (so 1/8th of the total dough). Hi Paola, I was wondering if guar gum could be used instead of xanthan gum? It’s like half the price? Just curious. Hi Leticia! Honestly it doesn’t work as well and you end up using nearly twice as much, so not worth it? How many crackers are in a serving? could you make these up, cut into shapes, egg washed and spiced then put in the freezer for a couple of weeks? Take out for maybe 10 minutes then bake? I love your web site and tell all my low-carb friends about it. First, let me say that these crackers have the best taste ever! I have made 4 batches so far. The only issue that I am having is keeping them together. They seem to come out very fragile and fall apart if I bump them. Not sure what I am doing wrong. I reduced temp to 250 and baking slower so as not to burn them. Are you weighing your ingredients including the butter? I am using volume instead of weight. I also wasn’t paying attention and only used 1 tsp of vinegar. Would that make such a difference? All in all, I will keep using this recipe. I am thinking that it would make a tasty pie crust too. Do I need to have softened butter or melted butter?? Could you convert this recipe for me to cups instead of grams? I googled it, but want to make sure I am correct! Paola, You are making my first Keto Christmas so very happy! 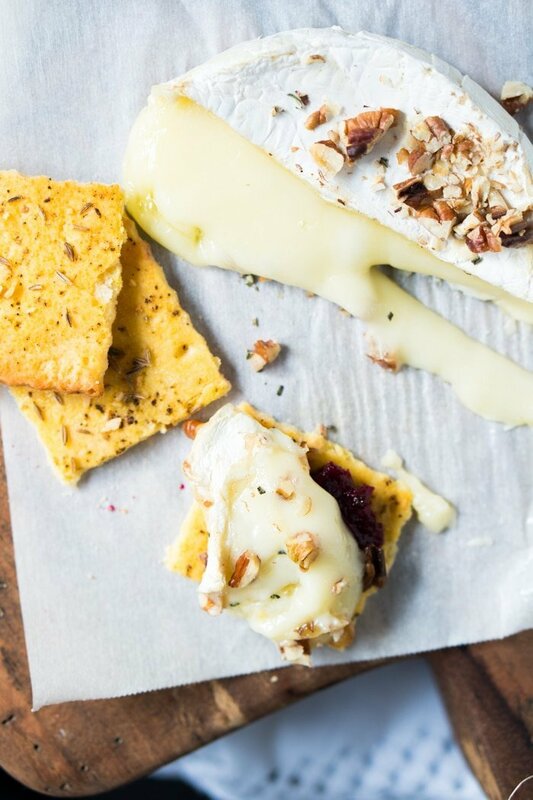 Yesterday we received a cheese and cracker gift basket and I immediately took to your site. As usual, your recipes never disappoint! I do not have a food processor, so tried a blender (didn’t work), then mixer. The dough was probably a little over processed, so after I rolled it out between parchment, I put it in the freezer for a few minutes before I cut out squares. They were absolutely amazing with Roquefort Cheese and Prosciutto – that was my delicious dinner! Happy Holidays from a loyal fan! Do you need to spray the cookie sheet or cook on wax paper or just directly on cookie sheet? Parchment or baking mat xo! These look SOOoooo good! I was thinking of making them as part of a Christmas menu, an appetizer. Could I make them a couple of days before? And if so, what would be the best way to store them? Def! Airtight container, can always pop them back in the oven for a few if they get a bit soggy. Alternatively, make the dough, shape and bake as needed xo! I love these way more then their gluten brother! Thank you. OMG – I can’t believe how good these are. I wanted crackers to eat with cheese, but these are so good I just keep eating them straight off the pan. They taste a lot like savory shortbread – I bet you could add a sugar substitute and make them into shortbread cookies. How long will these keep? Better in the refrigerator? Better in freezer? Better on shelf un tupperware? Love these crackers!! They are the best! Just one question: Do these have to be stored in the refrigerator since they have cream cheese in them? If not, is there a certain length of time that they should be used by? Since it’s baked you can keep them at room temp 😉 xo! How think are you supposed to roll the dough? I can’t find way to access the video. I can’t find this video either – it’s referenced twice on this page, yet not with a link. I’ve looked and looked. PLEASE ADD THE VIDEO LINK! Are you running an ad blocker by any chance? Duh… I see the directions for cutting the dough. 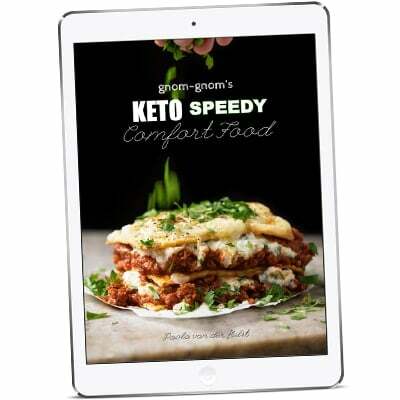 First I have to say I have tried many of your recipes on the site as well as from your cookbook since adopting the Keto lifestyle in March. (I confess I visit the site daily and it is on my lap top for hours as a time!). I HAVE LOVED EVERY SINGLE ONE! And I have learned so much! Your explanations with each recipe are truly appreciated as well. I am also impressed with your generosity – from the obvious care you take in creating and sharing the recipes, to the photography, your replies to the comments – everything! You are an inspiration to us all that find ourselves needing a grain and /or gluten free diet. With these recipes my family has eaten so much better than we ever did before! Thank you! Thank you! Thank you! As far as this particular cracker recipe goes….. and in case anyone else has issues with rolling out dough in general and may be intimidated to try making crackers (as am I) – here’s a tip I found very helpful. Use a tortilla press! I cut the chilled dough into small chunks and rolled them into a ball and pressed each one between sheets of parchment paper. To quote you, Paola – “easy peasy”! The final result was a cracker a bit bigger than I will do next time – and it will be easier to get a crunchier cracker with a smaller chuck and maybe a few more presses…. but so much easier for me than rolling! 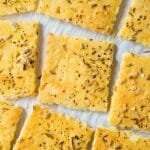 Also – I made these crackers without topping or an egg wash – to use with a garlic and herb alouette – they are truly delicious! Thanks again. I am forever a devoted fan. Just made and promptly inhaled these. Sooo satisfying and a wonderfully delicious alternative to the typical fathead crackers I see everywhere. I haven’t made your pie crust yet but now I am oh-so-excited to do so. I believe there is a bacon quiche in my very near future!! Do you have a preferred method for storing these? Refrigerated? Covered at room temp? Thanks so much!!! How thick should the crackers be when rolled out? Excited to try them…. These look fantastic! Would love to make them right now, but I don’t have the xanthan gum. Is there anything that could be substituted …perhaps vital wheat gluten? We are just starting Keto. Many ingredients are new to me and I need to understand them better. Thank you Paola, for your assistance. Hi Judy! Xanthan gum does replace gluten, so vital wheat gluten would be a sub. Unfortunately I cannot guide you on amounts as I have Celiacs so I don’t use any product with gluten (also note that strict keto is gluten free). If you make them without it they’ll just be more fragile xo! Thank you Paola for such a speedy reply! Since I do have vital wheat gluten, but do not have the need to be gluten free, I will make the dough and chill it till tomorrow. I know that it takes 2 cups of vwg along with other ingredients to make a whole batch of bread dough enhancer and only 1 Tbsp. per cup of flour in the recipe. So… will take a semi-educated guess and use a rounded tsp. of vwg for my first try. I will definitely buy the xanthan gum on my next shopping trip and the come back to rate it when I’ve made it with the proper ingredients. Thanks so much. Love your site! So happy you’re enjoying the site Judy! Just keep in mind that you’ll want to use less of the vital wheat gluten for cookies than you do for bread dough (you might get tough cookies otherwise… or at least from what I remember from my gluten-baking days!). xo! Hi. How did it work using gluten? Like you, I am trying to cut carbs but at this point can still tolerate gluten. Did it work? 1 tsp was good? Can these be made with almond flour only? Hi Cathy! These can’t, but there are two other cracker recipes on the site which use all almond flour 😉 xo! Do you score the dough prior to baking? Hello Paola, thank you for all the great keto recipes. I’ve made many and love them. Do you put them in the dehydrator after baking or instead of baking? Wondering the same thing? Baked or just dehydrated? 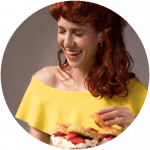 Hello Paola, I love your site – it’s fun and recipes are super delicious! I made these crackers and they are by far the best Keto Cracker recipe. Only one thing made an improvement. I put them in my food dehydrator (Excalibur) and presto!!! crispy, crunchy crackers! OHHHH that’s SUCH a great idea Georgia! I’m so sorry that I missed your comment before, but thanks so much for this idea! xo! Georgia, about how long did you add them to the dehydrator? Did you get the answer to the oven/dehydrator question? Thank you so much for your US equivalent measurements option on your recipe(s). I have had to go through the lengthy conversion process with many others’ recipes. It’s considerate of you to do that for us! Also, these crackers are the bomb! One thing about trying to not eat conventional, factory-made snacks is that I REALLY crave something salty, flaky and crunchy at the end of the day. These do the trick.